The USGS is investigating whether changes in phenology are evident in Shenandoah National Park through the use of time-sequenced satellite imagery, field investigations, and spatial modeling. 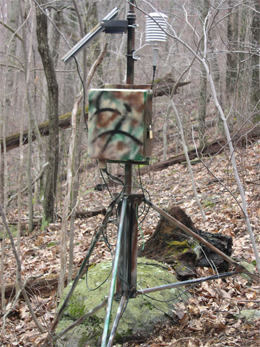 Currently there are six remote sites collecting data in Shenandoah National Park. The latest site is providing real-time data via the GOES satellite. Global- or regional-scale climate changes may be compounding the disturbance regime and may have dramatic consequences to Appalachian mountain ecosystems. Vegetation phenology can be used to track changes in climate, and measurements can be scaled from field observations to regional patterns evidenced in satellite imagery.